Our staff at Medifocus is committed to keeping our subscribers to the Medifocus Digest Alert on Parkinson's Disease abreast of the latest new research developments that have recently been published in the medical literature for this condition. In this issue of the Digest Alert, you will find a focused list of hand-picked journal article references that represent the latest advances in basic and clinical research for Parkinson's Disease. These articles represent the current state-of-the-art of the research that will hopefully lead to additional major advances and breakthroughs in the clinical management of Parkinson's Disease. You can access the summaries of each article referenced below by simply clicking on the article Title. We will continue to update you with the latest scientific and clinical developments through the Medifocus Digest Alert on Parkinson's Disease every 3 months. Thank you for your ongoing subscription to this publication. 1: A Non-Invasive Medical Device for Parkinson's Patients with Episodes of Freezing of Gait. Institution: Telecommunications Research Group, Universidad Politecnica Salesiana, Cuenca 010105, Ecuador. bpunin@ups.edu.ec. 010105, Ecuador. bbarzallo@ups.edu.ec. Venezuela. clotet@usb.ve. 010105, Ecuador. abermeo@ups.edu.ec. 010105, Ecuador. mbravog@ups.edu.ec. 010105, Ecuador. jbermeo@ups.edu.ec. carlos.llumiguano@yahoo.com. Journal: Sensors (Basel). 2019 Feb 12;19(3). pii: s19030737. doi: 10.3390/s19030737. Institution: Department of Neurology, University of Maryland School of Medicine, 110 South Paca Street, 3rd Floor, Baltimore, MD 21201, USA. Electronic address: sreich@som.umaryland.edu. Journal: Med Clin North Am. 2019 Mar;103(2):337-350. doi: 10.1016/j.mcna.2018.10.014. Epub 2018 Dec 3. 3: Randomized Delayed-Start Trial of Levodopa in Parkinson's Disease. Institution: From the Department of Neurology, Amsterdam Neuroscience (C.V.M.V., S.R.S., J.A.B., R.M.A.B. ), Clinical Epidemiology, Biostatistics, and Bioinformatics (M.G.W.D. ), and the Clinical Research Unit (R.J.H. ), Amsterdam UMC, University of Amsterdam, AMC, Amsterdam, the Department of Neurology, Radboud University Medical Center, Donders Institute for Brain, Cognition and Behavior, Nijmegen (B.P., B.R.B. ), the Department of Neurology, Leiden University Medical Center, Leiden (J.J.H. ), the Department of Neurology, University Medical Center Groningen, University of Groningen, Groningen (T.L. ), the Department of Neurology, Zuyderland Medical Center, Heerlen (G.T. ), and the Department of Neurology, Spaarne Gasthuis, Haarlem (A.G.M.) - all in the Netherlands; the Department of Neurology, University Medical Center Schleswig-Holstein, Kiel, Germany (G.D.); and the Edmond J. Safra Program in Parkinson's Disease and Morton and Gloria Shulman Movement Disorders Clinic, Toronto Western Hospital, University of Toronto, Toronto (A.E.L.). Journal: N Engl J Med. 2019 Jan 24;380(4):315-324. doi: 10.1056/NEJMoa1809983. 4: Role of Ketogenic Diets in Neurodegenerative Diseases (Alzheimer's Disease and Parkinson's Disease). Institution: Department of Dietetics, Faculty of Human Nutrition and Consumer Sciences, Warsaw University of Life Sciences (WULS-SGGW), 159c Nowoursynowska Str., 02-776 Warsaw, Poland. dariusz_wlodarek@sggw.pl. Journal: Nutrients. 2019 Jan 15;11(1). pii: nu11010169. doi: 10.3390/nu11010169. 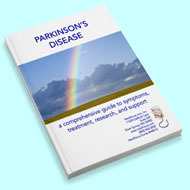 5: A study of the effects of 8-week acupuncture treatment on patients with Parkinson's disease. Institution: College of Korean Medicine, Sang Ji University, Wonju. ; Department of Meridian and Acupoint, College of Korean Medicine and Research Group of Pain and Neuroscience, WHO Collaborating Center for Traditional Medicine, East-West Medical Research Institute, Kyung Hee University, Seoul, Republic of Korea. ; Donders Institute for Brain, Cognition and Behaviour, Radboud University, Nijmegen, Nijmegen, The Netherlands. Journal: Medicine (Baltimore). 2018 Dec;97(50):e13434. doi: 10.1097/MD.0000000000013434. 6: Pharmacokinetic drug evaluation of CVT-301 for the treatment of Parkinson's disease. Institution: a Departement of Neurology , University and Institute for Research and Medical Care, San Raffaele Rome , Roma , Italy. Milan , Italy. Care, San Raffaele Rome , Roma , Italy. Care, San Raffaele Rome , Roma , Italy. Raffaele Cassino , Cassino (FR) , Italy. Journal: Expert Opin Drug Metab Toxicol. 2018 Dec;14(12):1189-1195. doi: 10.1080/17425255.2018.1550483. Epub 2018 Dec 2. 7: Chemical management of levodopa-induced dyskinesia in Parkinson's disease patients. Institution: a Neurology Clinic, CCS, School of Medicine , Universtiy of Belgrade , Belgrade , Serbia. Serbia. Serbia. Serbia. Journal: Expert Opin Pharmacother. 2019 Feb;20(2):219-230. doi: 10.1080/14656566.2018.1543407. Epub 2018 Nov 9. 8: Music and movement: Towards a translational approach. Institution: International Laboratory for Brain, Music, and Sound Research (BRAMS), Montreal, Canada; Department of Psychology, University of Montreal, Montreal, Canada; Centre for Research on Brain, Language and Music (CRBLM), Montreal, Canada. Electronic address: simone.dalla.bella@umontreal.ca. Journal: Neurophysiol Clin. 2018 Dec;48(6):377-386. doi: 10.1016/j.neucli.2018.10.067. Epub 2018 Nov 3. 9: The Role of Atomoxetine for Parkinson Disease-Related Executive Dysfunction: A Systematic Review. Institution: From the Geriatric Research, Education, and Clinical Center and. Journal: J Clin Psychopharmacol. 2018 Dec;38(6):627-631. doi: 10.1097/JCP.0000000000000963. 10: Adjunctive Therapies in Parkinson's Disease: How to Choose the Best Treatment Strategy Approach. Institution: Instituto de Medicina Molecular, Lisbon, Portugal. Italy. Universidade de Lisboa, Av. Prof. Egas Moniz, 1649-028, Lisbon, Portugal. Centro Hospitalar Lisboa Norte, Lisbon, Portugal. Universidade de Lisboa, Av. Prof. Egas Moniz, 1649-028, Lisbon, Portugal. joaquimjferreira@gmail.com. joaquimjferreira@gmail.com. Journal: Drugs Aging. 2018 Dec;35(12):1041-1054. doi: 10.1007/s40266-018-0599-2. 11: Nighttime Sleep and Daytime Sleepiness Improved With Pimavanserin During Treatment of Parkinson's Disease Psychosis. Institution: Parkinson's Disease and Movement Disorders Program, Henry Ford Hospital, West Bloomfield, MI. Bloomfield, MI. Irvine. Jolla, CA. Journal: Clin Neuropharmacol. 2018 Nov/Dec;41(6):210-215. doi: 10.1097/WNF.0000000000000307. 12: Patients' Expectations and Satisfaction in Subthalamic Nucleus Deep Brain Stimulation for Parkinson Disease: 6-Year Follow-up. Institution: Department of Neurosurgery, Taipei Medical University-Wan Fang Hospital, Taipei, Taiwan; Graduate Institute of Injury Prevention and Control, College of Public Health and Nutrition, Taipei Medical University, Taipei, Taiwan. Health Partners, London, United Kingdom; Institute of Psychiatry, Psychology & Neuroscience, King's College London, London, United Kingdom. Electronic address: h.hasegawa@nhs.net. Health Partners, London, United Kingdom. Excellence, King's College Hospital, King's Health Partners, London, United Kingdom. Health Partners, London, United Kingdom; Institute of Psychiatry, Psychology & Neuroscience, King's College London, London, United Kingdom. Journal: World Neurosurg. 2019 Jan;121:e654-e660. doi: 10.1016/j.wneu.2018.09.181. Epub 2018 Oct 4. 13: The effects of exercise on cognition and gait in Parkinson's disease: A scoping review. Institution: PERFORM Centre, Concordia University, 7200 rue Sherbrooke O, Montreal, H4B 1R6, Canada. Electronic address: brittany.intzandt@mail.concordia.ca. Dublin, 2, Ireland. Electronic address: becke@tcd.ie. Electronic address: carolina.silveira@sjhc.london.on.ca. Journal: Neurosci Biobehav Rev. 2018 Dec;95:136-169. doi: 10.1016/j.neubiorev.2018.09.018. Epub 2018 Oct 3. 14: Istradefylline for the treatment of Parkinson's disease: is it a promising strategy? Institution: a Center for Parkinson's Disease , IRCCS San Raffaele Pisana , Rome , Italy. Journal: Expert Opin Pharmacother. 2018 Nov;19(16):1821-1828. doi: 10.1080/14656566.2018.1524876. Epub 2018 Oct 11. 15: The effect of continuous levodopa treatment during the afternoon hours. Institution: Department of Micro-data Analysis, Dalarna University, Falun, Sweden. Journal: Acta Neurol Scand. 2019 Jan;139(1):70-75. doi: 10.1111/ane.13020. Epub 2018 Sep 24. 16: Acute Dementia After Deep Brain Stimulation in Parkinson Disease. Institution: Department of Neurology and Laboratory of Functional Neurosciences, Amiens University Medical Center, Amiens, France. Electronic address: laurent.puy@hotmail.fr. ; Department of Neurosurgery, Amiens University Hospital, Amiens, France. Journal: World Neurosurg. 2018 Nov;119:63-65. doi: 10.1016/j.wneu.2018.07.197. Epub 2018 Jul 31. 17: Efficient treatment of Parkinson's disease using ultrasonography-guided rhFGF20 proteoliposomes. Institution: a School of Pharmaceutical Sciences & Center for Structural Biology , Wenzhou Medical University , Wenzhou , Zhejiang , China. Journal: Drug Deliv. 2018 Nov;25(1):1560-1569. doi: 10.1080/10717544.2018.1482972. 18: Factors associated with spousal burden in Parkinson's disease. Institution: Centre expert Parkinson, service de neurologie, CHU de Limoges, 2, avenue Martin-Luther-King, 87025 Limoges, France. Electronic address: centre.parkinson@chu-limoges.fr. ; Centre expert Parkinson, IMNc, CHU de Bordeaux, 33000 Bordeaux cedex, France. Journal: Rev Neurol (Paris). 2018 Dec;174(10):711-715. doi: 10.1016/j.neurol.2018.01.372. Epub 2018 Jul 20.